Citi Treasury and Trade Solutions can count 81% of F500 companies as clients. The bank provides its corporate clients with leading solutions such as Citi Treasury Diagnostics, a benchmarking and analysis tool that measures performance and provides feedback and analysis in such areas as working capital and liquidity management, entity funding and repatriation as well as systems and technology. The bank has made major investments in areas such as liquidity management and receivables management through tools like Citibank Online Investments and Money Fund Analytics, and its ‘Payments-On-Behalf-Of’ services for corporate in-house banks. The bank’s CitiDirect BE digital banking solution has garnered accolades for 11 years running in independent research firm Greenwich Associates’ Digital Banking benchmarking study. CitiDirect BE is particularly strong in client onboarding and cross-product integration, and its CitiConnect service provides a range of technology integration solutions, including solutions for File/SWIFT connectivity and the CitiConnect ERP Integrator. The bank also offers out-of-the-box solutions that are highly user-focused, such as InfoPool, by which Citi collects daily account statements from third party banks, collates them and sends a single statement to the client. InfoPool also has the functionality to produce statements to send to a client’s other banking partners in a variety of formats. Citi provides a suite of analytics tools to examine and improve liquidity and investment structures for greater operational efficiency. With one of the largest footprints of any global bank, you would be hard-pressed to find a bank with similar advantages when it comes to regional and global liquidity management. Most particularly, the bank has structured liquidity desks in various global locales to support and facilitate investment transactions in disparate regions and countries worldwide. The structure provides several advantages for customers. For one thing, clients can access real-time market updates and trade execution support. In addition, the bank provides tailored liquidity solutions for various maturities and has, for example, engineered liquidity products specific to maturities longer than overnight. The bank provides Global Liquidity Management programs, such as notional pooling and target balancing, where appropriate. Moreover, it has launched innovative new services, such as Citibank Online Investments and Money Fund Analytics. In addition, the TreasuryVision Global Liquidity Portal is an integrated solution to provide enterprise-wide visibility of global financial information, with analytics to help in managing risk and liquidity, together with a number of treasury workflow tools to increase efficiency. The bank has a CET1 ratio of 12.5%. The bank long ago built its name as a cornerstone payments provider around the world, and its market-leading position in this space continues. Citi’s Integrated Payables Solutions provides a suite of leading-edge analytics, core and emerging payment services, for domestic and cross-border payments, B2B commercial cards, and wholesale payments. The bank has launched a number of services in recent years to address specific problems for corporate clients, such as “Citi Payment Exchange to support payment digitization, and Citi Integrated Freight Processing to help optimize management of logistics spend,” notes the bank. Its CitiConnect services make it easy to get on board with their solutions and supports integration with internal systems. Citi boasts more than 80% of the Global Fortune 500 companies as clients of its banking, payment and trade services. The bank has a CET1 ratio of 12.5%. Major money market fund reforms in the US have now taken effect, including the requirement for prime MMFs to move from a stable to floating net asset value, along with the imposition of redemption fees and liquidity gates in certain cases. One key result is that many investors, including many corporate investment managers, have focused on government MMFs and away from prime funds. Corporates are looking for advice and help in understanding what the changes mean, whether there will be further changes, and how they should respond. The asset management arm of banking giant J.P. Morgan is one of the largest and most diverse investment management outfits in the world, and regularly provides insights, as above, for its diverse clients. It has a unit dedicated to liquidity investment—J.P. Morgan Global Liquidity—which is well-positioned to understand and assist North American corporate investment managers with their short-term investment needs. The bank’s Global Cash portal, its’ trading and account management solution for Global Liquidity customers, helps companies best manage cash and liquidity needs in the region, and worldwide. J.P. Morgan Asset Management has global assets under management of $1.7 trillion, and the banking group has a CET1 ratio of 12.4%. BNY Mellon is one of the leading providers of working capital management solutions worldwide, according to recent research. The bank stands out not only for its range of offerings, but also for its unique solutions to local problems. It is involved in key initiatives to further enable digitization of the supply chain and trade, such as the blockchain. But probably the most game-changing development for the bank is its move to NEXEN—an open-source, Cloud-based technology platform. Ian Stewart, CEO, BNY Mellon Treasury Services notes: “BNY Mellon has for many years been a thought leader regarding the impact of regulation. 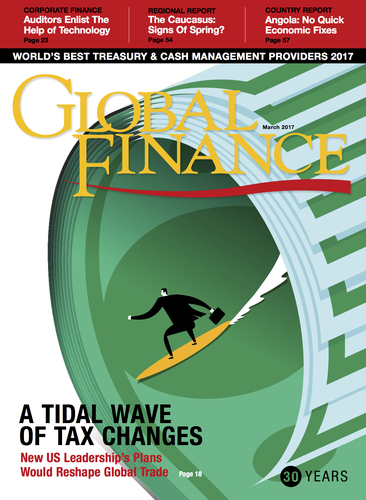 Regarding new technologies, we have been proactive, both partnering with fintechs when optimal, and advancing proprietary technologies, such as our NEXEN platform.” An example of the way in which the bank helps its clients dig into their financial processes to free up working capital is to leverage the clients’ core payables function into a working capital advantage via supplier finance programs. Its Payment Analytics service does a deep dive into a company’s payments processes to anticipate the availability of funds and to increase efficiency in managing current cash positions. On the procurement side, the bank helps companies to optimize payment terms and work with procurement, suppliers and the finance team to set working capital targets. The bank has a fully phased-in CET1 ratio of 11.3%.